Buckle up, DC All Access Fans, and get ready for some more video clips from both Tiffany and Jason. In this weeks selection Tiffany takes a ride with the Joker, has a one on one with Arrow, and then gets the low down on all things Gotham. While she's doing this, Jason, on the other hand, grooms his beard. Bless. Nine hundred and fifty-seven issues ago, Action Comics was at number one. Now it's back, and hitting the stands stronger than ever before. Some of the best Superman stories ever told have been told in the pages of Action Comics, so now with Action entering a new era with "Rebirth", the moment seemed right to revisit some of them again, Top 10 style. In this clip, we talk with Flash writer Joshua Williamson about where this new series will take the Fastest Man Alive, if in fact, he IS still the Fastest Man Alive, especially after the events of DC Universe: Rebirth #1. A bold new era for the Dark Knight begins this month! So much so, in fact, we're talking to Tom King, the co-writer of Batman: Rebirth, a special one-shot that sets the stage for Batman's exciting adventures to come. What do Gotham's two new vigilantes mean for the Dark Knight? What role will Duke Thomas play in the unfolding events? And is all this really building up to the greatest battle in Batman's history? One thing's for sure, you're not going to want to miss it! Ride the New Six Flags Joker Coaster with Tiffany Smith! What's it like entering the mind of a madman? Tiffany Smith finds out as she rides the brand new Joker coaster now open at Six Flags Great Adventure, in New Jersey, before talking to its President, John Fitzgerald. Does The Mad Hatter Come to Gotham in Season 3? If you thought life in Gotham was wild before, wait till you get a load of it in Season 3! In this exclusive clip, we talk to the cast of Fox's Gotham about bringing Season 2 to a triumphant close and what lies ahead in the show's eagerly awaited third season. In short, more super-villains, possibly including one who's absolutely mad. 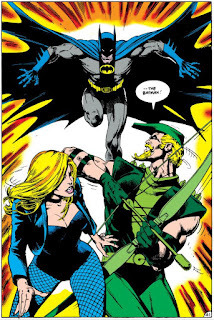 Is Oliver Queen's past coming back to haunt him? In this episode of DC All Access, Tiffany goes one-on-one with Green Arrow himself, Stephen Amell, who gives us the goods on what we can expect next season.